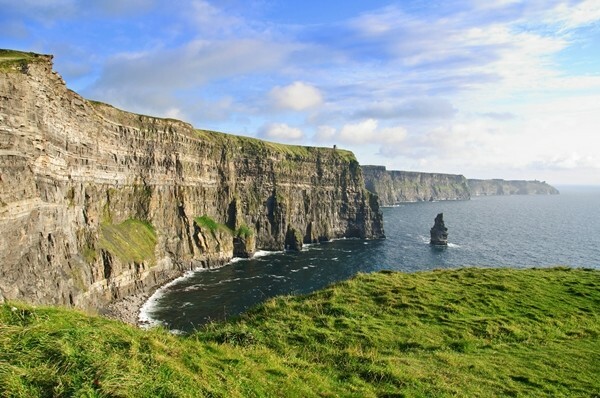 Accessible easily from the Lahinch town of the county Clare in the west of the nation, the Cliffs of Moher are one of the most extraordinary attractions as well as one of the most impressive natural wonders of Ireland. Made up of Namurian shale beds as well as sandstone on the border of the Burren area, this coastal stack when looked from the visitors’ center seem to overlap one another even though they tower up to 230 metres from the foamy waves of the blue Atlantic and expand more than 8 km along the coastline. And this is the main feature that pulls thousands of tourists at this site each year. And yes, also look at the bottom of these cliffs to gaze at the oldest rocks as well as ancient river channels now almost 300 million years old making the way through the base. 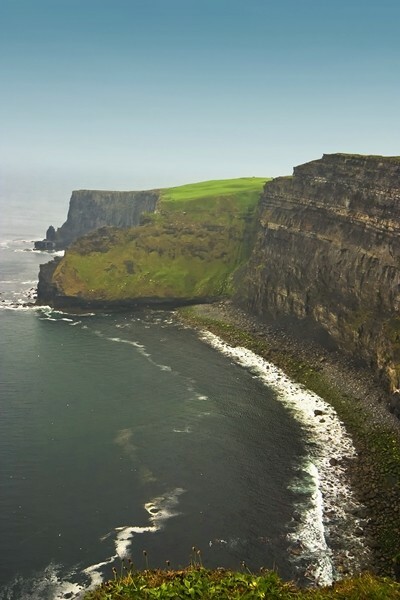 The Cliffs of Moher are flanked by the Hag’s Head in the south. However, it is the north of the famous O’Brien Tower where you get to see these cliffs at their highest point. Besides the cliffs, this tower also holds the attention of the visitors, which was constructed by a descendant of Brian Boru, Cornelius O’ Brien, just for making an impact on the female visitors as a round observation tower. Local lore considers this man as a visionary who guessed that the area could draw tourism for the financial help of the locals. Today, the tower of grey stones atop the cliffs replicates a small medieval castle from where one can easily enjoy the vistas of the Loop Head peninsula as well as the Connemara hills on a clear day. One of the most exciting activities is to stroll along the Cliffs of Moher. However, one should be quite careful due to the lack of the safety barriers and some faulty cliff sections. For those who like some risky adventures, simply walk to the cliffs’ edge and bravely enjoy the blue vistas of the Atlantic below. If you stand on them on a clear day, your breathtaking vistas from here tend to include the Galway Bay, its Aran Islands, and the hills as well as valleys of Connemara. In short, the sharp plummet from a relatively flat meadow at 700 feet until the Atlantic shore is just a breathtakingly picture-perfect site! I would recommend coming here on a clear day as the cliffs become fascinating with the grasslands atop and projections at the sides against a lively blue sky throng by the abundant flying seabirds. With this, it is easy to conclude that you are bound to encounter one more attraction here: the beautiful wildlife and birds. However, this is the paradise for the bird lovers rather than the animal fans as birds are seen more than the animals. There are thousands of birds of 25 different species of which the most vital bird here is the Atlantic Puffin that live only here in big colonies at the remote areas of the cliffs as well as on the little Goat Island. To see them, it is advisable to come in April or May as this is the time of their breeding in the nests. Some more birds that you can easily spot include ravens, hawks, choughs, Common Shag, guillemots, and gulls. Do not leave without visiting the state-of-the-art visitors’ center (with a fee) as well as the multimedia exhibition named as the ‘Atlantic Edge’ (it is also the name of the center) revealing much about the environment here. At the center, you can expect improved viewing platforms, retail center, restaurant, as well as an audio-visual theater. Dress warmly on your visit here due to the cool Atlantic winds and yes, wear sturdy shoes.